Healthy, Happy, and Safe 2012! This will be my last entry for 2011, and I absolutely cannot believe the year is over! I just want to take a minute to wish you all a Happy, Healthy, and Safe 2012! Happy New Year!! I hope 2012 is happy healthy year for you and your family. May all your decisions and moves bring you happiness. It’s been great to be part of your blog! Happy New Year, Danna!!! Danna, thank you for your wonderful blog. I really enjoy it. good book to finish the year out with——– that is until I got to the last few chapters of the book! Then I thought that I had stepped into the Twilight Zone! But my long ago passed away grandmother had a saying that what a person does on new year’s day that person will do repeatedly for the next year. Well, I don’t want to be a crabby crouch all of this year so I will wait until tomorrow to comment on this book! Have a good year anyway! HAPPY NEW YEAR!! A HAPPY HEALTHY 2012 TO ALL!! Happy New Year! In response to Regina. You are not the only “kooky ” one because I too feel like I am there when I read . I think that is what makes a good writer / author – someone who takes your wherever they are. I agree with Denise as well. I have my favorite cozies, and they are my favorites because I have grown to love the settings and characters. I find things in common with the characters in the series I read and that is why I read and enjoy them. If I did not connect with the characters and care about them I don’t think I could continue with the series. So “kookies” of the world unite!!! Viva-la cozies!!! Denise, I totally agree with you on this. A great setting is an important part in the making a good author. Thank you, ALL, for the New Years salutations. 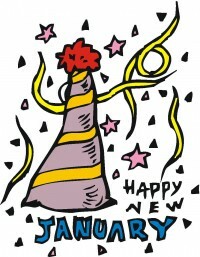 I hope 2012 is simply a terrific year for everyone! Oh Regina, I know just what you are saying! I too, sometimes think that I am a member of that community that I am reading about! I also think that I personally know the characters in these series books. I can almost feel what these characters are feeling, what they are thinking. These characters have become like family to me. Whenever something happy happens to then I feel the happiness. Whenever these people have something tragic happen to them, I feel so sorry for them. I want to do whatever I can to help them cope. Whenever someone does something to hurt my favorite characters I want revenge on the person doing the hurting. I suppose this is the true sign of a good writer, or a good story teller. Long live these type of writers and story tellers. Thank you for your comments, Regina. I think that it is common for a cozy mystery fan to feel exactly how you feel. I am about to start one of the Kate Kingsbury mysteries and will very much feel I am at the Bed and Breakfast. It is a wonderful escape from the cares of the day. Now that Christmas has just passed I remember the first book I got as a Christmas gift. It was a Trixie Belden mystery and it was in the Christmas of 1962. I loved that book and still have it stored in a safe place. I think my childhood love of that series planted the seed for my current enjoyment of cozy mysteries. Nancy, you are SO lucky to still have your treasured Trixie Belden mystery book. Because my family moved around so much, my parents would periodically “clean house” – which of course meant books, dolls, stuffed animals, you name it! I loved my Trixie Belden books! Also my Nancy Drew and Judy Bolton – as well as my brother’s Hardy Boys (I got double the reading!). My parents were suggesting that I did not need to keep them because I have so little room left – but I just can’t bear to give them up! It’s good to hear someone else loved Trixie Belden. I’ve spoken to people who did lots of reading who never heard of Trixie Belden. Nancy Drew was much more popular. I loved both of them, but was a little partial to Trixie Belden. I loved Trixie’s life and friends and neighborhood. To this day I believe my very first book planted the seed for my love of cozy mystery style of writing. I’ve kept many of my childhood books but Trixie Belden would definitely be the last to go. Regina, I hope your sinus infection has cleared up, and that you are feeling a little better while enjoying Mary Daheim’s mysteries on your Nook! Danna, I didn’t know just where to put this comment but I will try here. A few days ago people were discussing how sometimes we relate to some series as if the town, village or/and the characters become like family to us. I just finished reading “Naughty in Nice” by Rhys Bowen. Without giving too much of the plot away, much was said about how Adolph Hitler was starting to make himself known in Europe, how some people were portrayed in this book were not taking him seriously. Oh how I kept saying throughout this book “Take heed Europe, a monster is being let loose!” How much I wanted to turn back the clock for these people in Europe, because we all know what is in store for them! P.S. “Naughty in Nice” is the best Rhys Bowen yet!